New technology makes it easier than ever to say goodbye to body art, alter a tattoo, or remove a tattoo to make way for more beautiful designs. If your tattoo no longer reflects who you are and you want to start anew, it’s finally possible to leave your unwanted ink behind. Renew MediSpa offers powerful laser tattoo removal that can target a wide range of tattoos, from the most vibrant designs to the darkest body art. More importantly, it can clear your skin without necessitating a painful recovery or downtime. Renew MediSpa is led by Dr. Lisa Vuich, a tattoo lover and physician who’s done extensive research to find the most powerful treatment modalities for tattoo removal. It’s why we offer laser tattoo removal technology that exemplifies safety, efficiency, and more importantly, powerful results. Why Consider Laser Tattoo Removal? Maybe you’ve tried topical creams only to find out that they’re ineffective and simply bleach the skin. Maybe you find dermabrasion or excision to be too drastic and harsh a solution. Either way, you’ve probably been searching for the perfect way to remove, fade, or alter your tattoo. With Renew MediSpa’s powerful laser systems, you can finally treat your tattoo without a long recovery period and without harming your skin. Are you worried that your tattoo might not be receptive to laser tattoo removal? Considering the infinite amount of different designs out there, not all laser systems are capable enough to treat every tattoo. 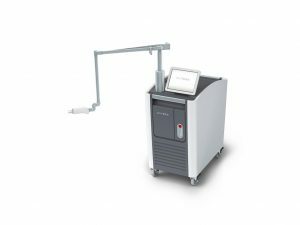 Renew MediSpa is proud to use two laser systems that are considered gold standards in the world of tattoo removal: the Astanza Trinity Lasers and Cutera Enlighten III Laser. 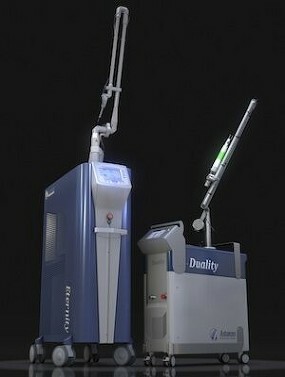 The Astanza Trinity Laser System is composed of two nanosecond lasers: The Duality and the Eternity. The cutting-edge Cutera Enlighten III offers two different pulse durations: nanosecond and picosecond, making it one of the fastest laser systems in the industry. 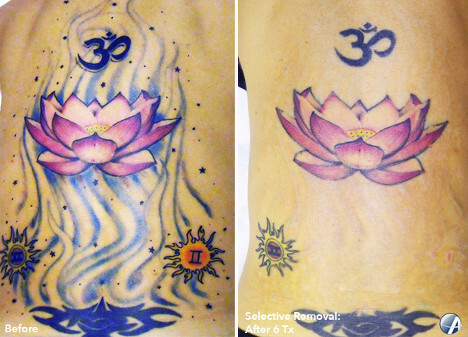 Our technology essentially uses laser energy to target and break up tattoo pigments. Different wavelengths of light can target different groups of colors of pigments, which is why it’s essential to have devices like the Astanza Trinity Lasers and Cutera Enlighten III that can produce a wide range of wavelengths. With our collection of lasers, Renew MediSpa is proud to have the most wavelengths available for laser tattoo removal in New England. Here’s how our devices work: the Astanza Trinity Lasers and Cutera Enlighten III deliver incredibly quick bursts of energy into the skin. Since the specific wavelengths are absorbed by specific inks, the skin is not harmed. The tattoo’s pigments then absorb heat energy from the device and they break up into tiny fragments. That incredibly fast pulse of energy also serves a bigger purpose than allowing for a more efficient delivery of energy: those lightning fast pulses create shockwaves that further break up the pigments. By efficiently breaking up the pigments, they’re more easily disposed of by the body’s immune system. 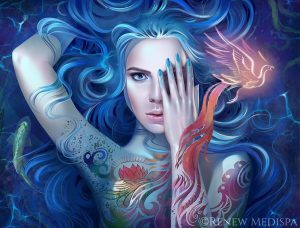 Over time, the body flushes away the pigments and the tattoo fades. The Cutera Enlighten III Laser delivers energy at the incredible speed of picoseconds—which is one trillionth of a second, while the Astanza Trinity’s Duality and Eternity Laser Systems offer high powered nanosecond (a billionth of a second) technology. Picosecond technology is incredibly fast, making it optimal for treating the small particles that make up tattoo pigments. The Cutera Enlighten III Laser’s powerful picosecond technology is also versatile enough to treat a number of skin conditions. With the Duality and Eternity systems, the Astanza Trinity Lasers’ nanosecond pulses are powerful enough to reliably eliminate ink pigments. At Renew MediSpa, we have the treatment modalities to provide laser tattoo removal with proper strength and speed. With each treatment, the Astanza Trinity Lasers and the Cutera Enlighten III are designed to shatter more particles than the last, ensuring an increasingly more effective fading and fewer treatments for the patient. The Astanza Trinity Lasers and Cutera Enlighten III are known for their immense power and versatility. The Cutera Enlighten III has picosecond capability and can target immensely tiny pigments, making it optimal for resistant tattoo inks. The Astanza Trinity Lasers emits three of the most popular wavelengths for treating virtually any tattoo of any color—even those with stubborn inks that are difficult to remove, like bright blue and vibrant green. No other medical spa in our region can provide optimal ink shattering and faster ink clearance than Renew MediSpa. About the size of a postage stamp. About the size of a business card. About the size of two hands. Half sleeve and other XL designs. Why is it Important to Have Different Wavelengths? Different wavelengths are more effective on specific groups of colors. Laser energy with a wavelength of 1064nm can target colors like brown, black, and dark blue, wavelengths of 532 are better at treating red, orange, yellow, and violet colors, and laser energy with a 694nm wavelength can target colors like vivid blue, bright green, turquoise, and teal. 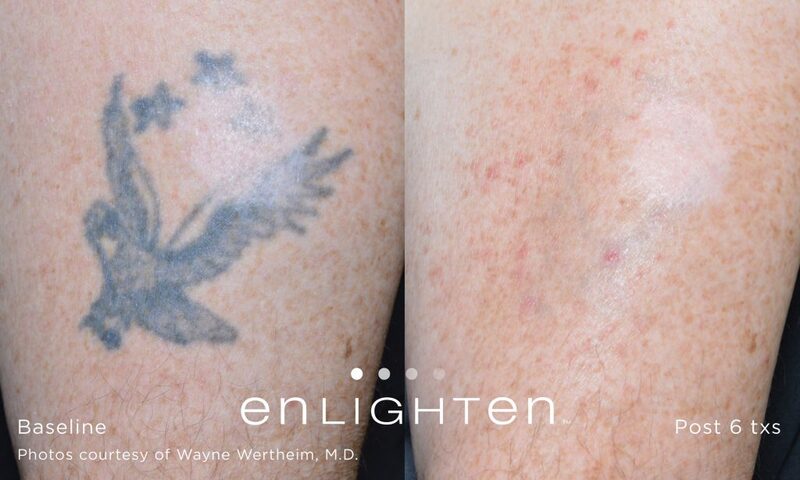 With a full range of wavelengths, our laser tattoo removal devices have the ability to treat a diverse range of colors and shades. 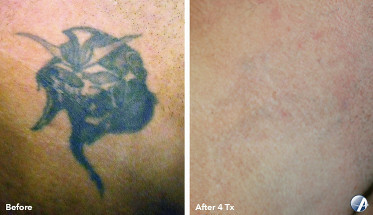 Many of our patients have reported that laser tattoo removal feels like a small rubber band snapping across the skin. In fact, many of them have also claimed that laser tattoo removal feels comparable, or less painful than receiving a tattoo. 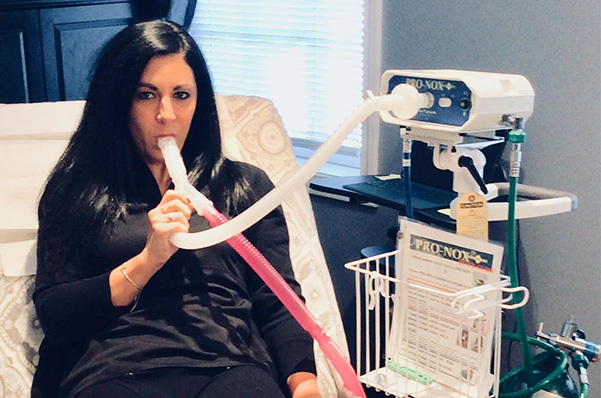 We use a Cryo 6 Chiller to make the sensation much easier to tolerate. What’s so Special about Picosecond Pulse Technology? Having picosecond pulse duration means the ability to deliver energy at the speed of a picosecond, which is a billionth of a second. By offering piscosecond pulse technology, Renew MediSpa offers one of the fastest laser tattoo removal systems in the industry. During the process of tattoo removal, ink particles get smaller and smaller. The smaller they get, the more difficult they can be to remove. Picosecond pulse duration allows for more efficient targeting of even very tiny fragments of ink, creating a more effective and efficient treatment. Once the ink particles have been shattered, the body’ immune system is able to clear them from the skin through natural processes. What are Tattoo Removal Side Effects? After their treatments, some of our patients experience redness, swelling, and soreness in the treatments areas. Thankfully, these side effects are temporary and should only last for less than a week. 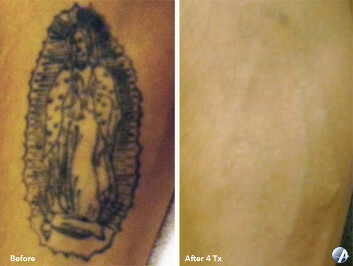 The results of laser tattoo removal are 100% permanent. Once the tattoo has faded it can’t return. Tattoos are usually composed of multiple layers of pigment, and it takes multiple sessions to treat each layer. The number of sessions you will need will depend on various factors: the size of the tattoo, the location of the tattoo, the different colors on the tattoo, whether you want a full or partial removal, whether you want to simply fade the tattoo, and so much more. Because Renew MediSpa offers powerful picosecond pulse technology, you could possibly have shorter treatment regimens than traditional methods. The best way to receive an accurate estimate of the number of tattoo removal sessions you might need is through a consultation with Renew MediSpa. Will Laser Tattoo Removal Give Me a Scar? Our laser tattoo removal treatments are performed by highly skilled and experienced medical professionals who will take great pains to make sure your skin will be safe and protected. However, if your tattoo gave you scarring, that might emerge once the tattoo has faded. Scar formation is always a possibility when using a laser system, which makes going to an experienced provider all the more important. If textural irregularities do arise in the skin, we have the modalities needed to address that, too. At Renew MediSpa, we’re experts on the latest tattoo removal technology. With our advanced picosecond and nanosecond laser systems and the skill and experience of our medical staff, Renew MediSpa can give a second chance for clearer, tattoo-free skin. To learn more about our laser tattoo removal procedures, contact us now, for a consultation. If you’re interested in learning more about our Tattoo Removal, call us today to schedule your appointment.